Lomo introduced the Instant Square as the first analogue camera on the market to use the Fuji Instax Square format film. It launched via another successful Lomography Kickstarter campaign, and as well as being compatible with the square format film, you can use Instax Mini film by changing the camera's back - making it the first multi-format instant camera in the world. Other features of the camera include a 95mm f/10 lens, which is equivalent to 45mm in 35mm terms. The camera is fully automatic, but there are a couple of functions which you can control as a user, including a multiple exposure, self-timer and long-exposure (Bulb) mode. The Lomo'Instant Square is available to buy in a number of different colour ways and packages - we have been using the Pigalle combo, which features a maroon coloured coating, and includes both the square back and the mini back, as well as a range of other accessories included in the box. The Lomo'Instant Square costs £199. p>Using a Lomo instant camera in combination with Instax film is probably about as simple as it gets when it comes to analogue photography. The Lomo'Instant Squarecamera accepts two Lithium CR2 batteries. If you’re not familiar with this type of battery, it’s basically like a short and stubby AA battery. It’s not quite as common as an AA battery, but you should be able to find them in hardware stores and the like - you can always order online if you’re struggling to find any. The batteries slot into the compartment at the bottom of the camera which is hidden behind a door. The next thing you’ll want to do is insert the film. 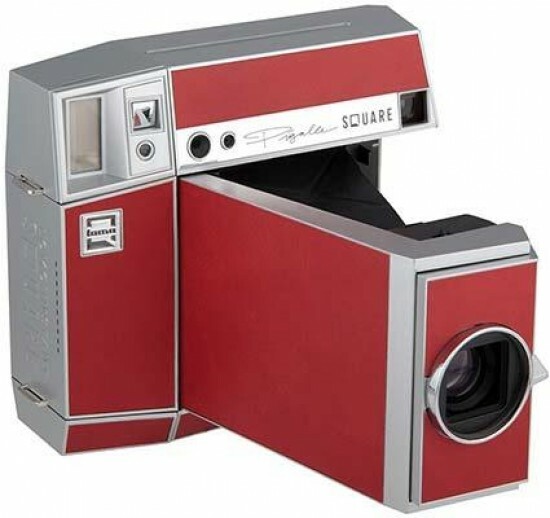 As standard, the Instant Square is fitted with the square back, which works with Instax Square film. The film door can be swapped if you’d prefer to use Instax Mini film. A small window in the film door allows you to see whether you’ve already got a pack of film loaded into the camera - if you have it’s important not to remove the back until you’ve used up all the film. That means that while the camera is “multi-format”, you can’t swap between the different formats for every shot. Simply release the Lomo'Instant Squarecamera’s back door and you can insert the correct film. This is a very easy process which just involves lining up two yellow marks, one on the camera itself and one on the film pack. Simply shut the door and you’re done. If you want to swap to the Mini back, it’s a very easy process - if a little fiddly. Unlock the back, and you’ll see a small black pin holding the bottom of the door in place - slide this out and remove the door from the camera entirely. You’ll find the mini back also has the same pin on it, so just swap them out, and push the pin into the relevant hole and you’re done. Also found on the film back is a “real-image viewfinder”. This is, in essence, simply a hole in the camera to allow you to roughly compose your shots, but it does include some guidelines to show you the difference between the square format film and the mini format. In its “closed” form, the Instax Square is quite bulky, but with a flat type design it’s not too difficult to fit in a bag - you’ll never get it in a pocket, but remember it has to house the film inside. The camera uses a bellows-type design, which means that when you want to use it, you need to expand the front by simply pulling it out and letting it fall into the correct place. When you want to close it again, push down on the metal arm which is holding the bellows open to close it again. When the bellows are closed, an inbuilt lens cap will slide over the lens to protect it when not in use - this will open automatically when the bellows are opened. Once the bellows are opened, you’re almost ready to shoot. There are three different focusing options - it’s important to remember to check this before taking your shot as it can have quite an impact. A slider can be used between the three options, with the default option being the 1-2.5metre option. You can also choose a 0.8 metre option, and an infinity option. You should choose the most appropriate one for your subject - with landscapes for example being set on infinity, while closer shots set on the 0.8 metre setting. If that isn’t close enough for you, there is also a “portrait lens” which allows you to get as close as 0.5 metres which is included in this combo box. On the back of the Lomo'Instant Squarecamera there’s a few different shooting options. You can leave these buttons completely alone if you like, with default options being selected. There’s a flash on/off button (which is on by default), the multiple exposure button, the option to add or remove exposure compensation, the shooting mode (Mode A - automatic is the default selection, a Mode B - bulb - is also available) and you can switch on the self-timer. After you’ve selected the relevant focusing option and your shooting modes, you’re ready to take your shot. Line it up in the viewfinder, and press relatively firmly down on the shutter release button, which is found on the front of the camera. This takes the shape of a Lomo logo and is a little on the discreet side - it’s easy to find with your forefinger though when holding the camera in a standard orientation. Creating multiple exposures is a fun element of cameras like this. To do it, you press the MX button on the back of the camera, you can then take as many exposures as you like before pressing it again when you’re finished to eject the finished result. It tends to be most effective when shooting two or three exposures, as any more than that tends to get a little messy. A “Splitzer” is also included in the box. This allows you to combine different shots in the same frame by using the multiple exposure mode. The Splitzer blocks off certain parts of the frame, allowing you to make two separate exposures on the same frame. For example, you could block off the left half and take a shot, then block off the right half and take another shot - leaving you with two completely different shots on the same piece of film. The Bulb mode can be used for creating long exposures - it’s best to use the camera on a tripod when attempting this. In Bulb mode, you press the shutter release down for as long as you want the shutter to remain open. The 10 second timer function is useful for selfies and group shots - again, if you’re creating a group shot, it’s best to use a tripod, or find another stable surface on which to rest the camera. Bearing in mind the 45mm equivalent focal length, you’ll need to stand quite far back to get a good amount of people in a group shot. In the bottom of the Lomo'Instant Square camera, you’ll see there’s a remote control which can be removed to use for shots from a distance. It accepts a coin-type battery (DL2032). If you don’t want to use the remote control, you can just leave this attached to the camera base and forget about it, but it’s useful to have for group shots and the like. The remote control has two buttons, one which will just take a shot, and one which will set off the 10 second self-timer. For those who like to take selfies, there’s a “selfie mirror” on the front of the camera. This is basically a small square of reflective material which allows you to roughly line up your selfie shots. Try to get your face as central as possible in the middle and it should come out on the film - again, with a 45mm equivalent focal length, you’ll need to try and hold the camera back reasonably far. The flash is switched on by default, but you may wish to switch it off in very bright conditions. The flash itself is hidden behind a small translucent window on the front of the camera. In the Pigalle combo, you get a few different coloured “flash gels”, which are thin strips of plastic in different colours - you can very easily place these in front of the flash via the small slot at the top of the camera. Other things which are included in the Pigalle combo box include photo clips, photo stands, glue dots and magnet stickers which you can use to display your Instax film shots. There is also a set of shooting tips cards to help you get to grips with how the camera works.